Benefits of Destratification | EcoAir | Destratification, Air Filtration and Energy Saving System | EcoAir | Let's clear the air. Consider a building with a 30 foot ceiling (illustration). To maintain some kind of temperature in the winter, the HVAC system is kicking on frequently because the thermostat measures temperature at floor level (A). Where is the heat it keeps pumping out? Trapped in the ceiling (B). The result is warm air at the ceiling, and cold air at occupant level while the HVAC system works overtime to regulate temperature. We’ve discovered that the problem is that most HVAC and air handling systems attempt to push hot air down - the opposite of where it wants to go. No matter where the vents are, heat rises quickly and gets trapped in the ceiling or is lost through the loading dock doors. 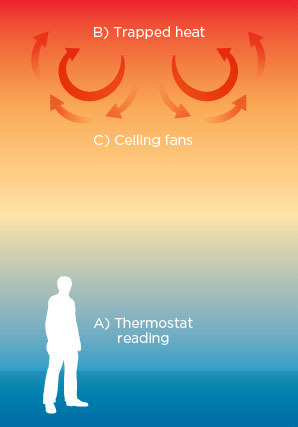 Ceiling fans have often been installed to fight the problem of stratification. The problem is, when they’re not on high speed, they really only move air around at the ceiling and don’t impact the ground level (C). When they are at high speed, they create a cool draft that is unwanted. As a solution, ceiling fans have gotten bigger, or you’ve installed more of them. The expense and invasive installation of fans and other systems begs for a simpler, more effective, less costly solution. Don’t fight nature, put it to work. Instead of pushing warm air down, the ecoair pushes clean, filtered air up. This creates a rolling air pattern that forces warm air trapped in the ceiling across it and down the other side. A cycle begins that uses all your warm and cool air supply, achieving even temperatures from floor to ceiling quickly and destratifying your facility. The volume of air moving through our system is a little over 1 million cubic feet of air per hour. With speed and an upward trajectory, the ecoair masters airflow rotation, ultimately eliminating stratification. As an enhancement to your existing HVAC system, you’ll have even temperatures from floor to ceiling, recovering heat 60% faster in the morning from night setback and in loading dock areas, where heat inevitably escapes. Imagine turning off HALF your heating system throughout most of the season and still keeping your building to temperature. Or what if you could set your temperature to 7 degrees at night and have your facility back at operating temperature by the time your employees arrive in the morning? Destratify your facility, eliminating stratification and controlling temperature in an efficient way relieves the strain on your HVAC system, and that saves energy. When you save energy, you save money. Imagine that, a work environment with clean air and comfortable temperature PLUS a reduction in energy use that ultimately saves you money. The ecoair system acheives all these things in one small package. Don’t fight nature. Put it to work. It makes sense. Click to learn how your ecoair system will save you money!